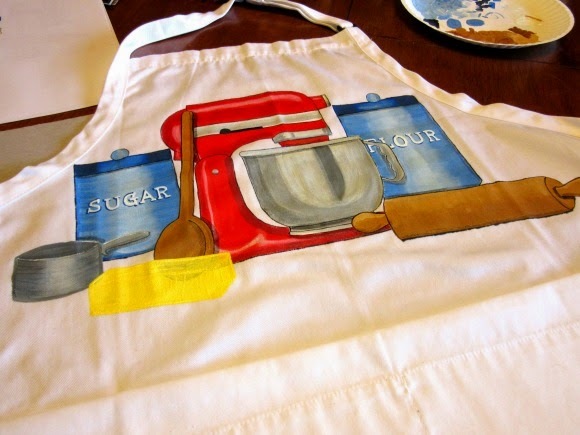 Spending time in the kitchen baking up something yummy just got a whole lot more fun if you’re wearing this hand painted Baking Therapy apron by Kudos Kitchen Paints. It was right before Christmas 2014 when I got one of the biggest compliments from a friend that I’ve ever received. She said something to the effect of being in awe of me in the way I keep reinventing myself. I was a little taken aback at such a compliment because I’d never looked at it that way before. The way I’d always looked at it was that I had a short attention span, and because my boredom always gets the best of me I needed to change things up often to keep my interest up. Maybe what I thought about myself was not really true after all. Maybe all the time I was only searching for the thing that felt “right.” The thing that would allow me to truly expand my passion for painting while still incorporating my love of creating yummy food in the kitchen. Who knew that every step I’d taken of “reinventing myself” over the past 30 years (jewelry artist, glassware artist, cookie artist, and again glassware artist) was leading me to this place of fabric artist? Maybe it’s presumptuous of me to call myself an “artist” but I finally feel secure enough in my own talent to feel comfortable in that title. It is with this new fabric painting place where I fall into a zen state. The place where time passes so quickly that I hardly even realize that the hours had ticked rapidly away. The place I feel I’m finally meant to be. The place where food and art truly collide. 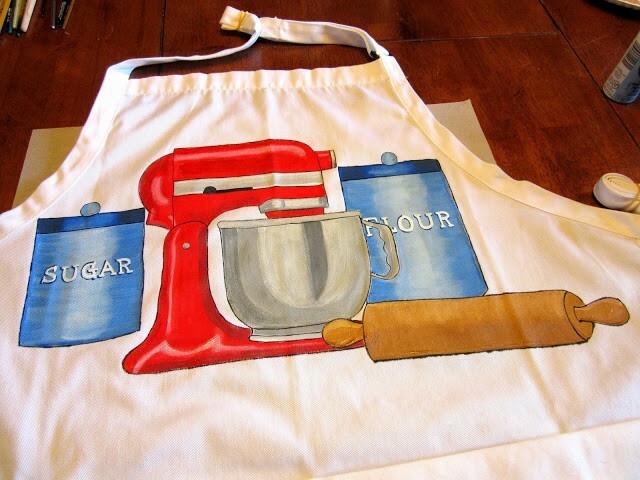 Since I’m debuting my new line of hand painted aprons, I feel it only fitting that I do a giveaway (details on how to enter is coming up) here on my food blog for this Baking Therapy apron. This design has attracted a lot of attention on my Facebook page, my Instagram, Twitter and hopefully soon on Pinterest, which is why it’s the one I’ve chosen this design to giveaway to one lucky winner. 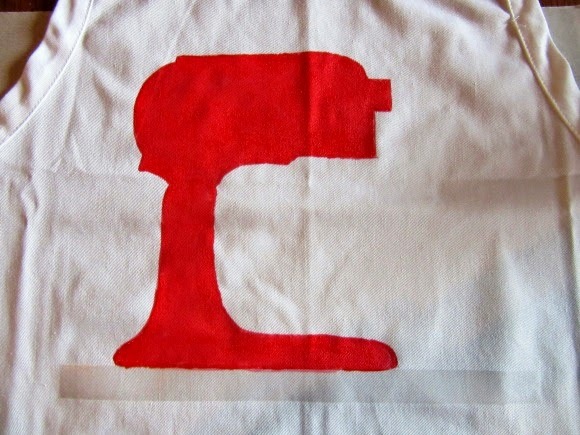 I’ve taken a bunch of step-by-step photos during the process of painting this apron. I hope you’ll enjoy seeing the details and how it went from a plain white apron to a bright, colorful, and whimsical apron that you’ll enjoy wearing while you’re creating deliciousness in your own home kitchen. 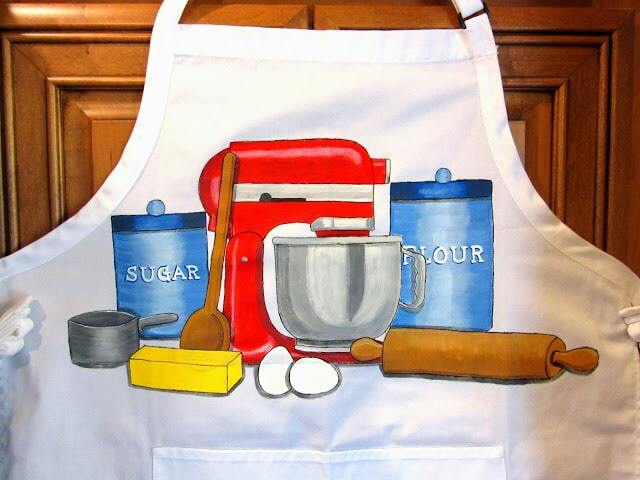 The aprons I paint on are of the highest quality, and ones that I myself choose to wear. They’re 65% polyester and 35% cotton. These aprons are treated with stain-release from the manufacturer, have extra long ties so you can wrap them around your waist if you choose, and have adjustable neck straps. But to me, the most important feature of all is that they have two large pockets, right in front. Priceless. They measure a full 34″ in length by 24″ in width, so one size will work for just about everyone. I wash each apron before I start painting on them with bright, vibrant paint made specifically for fabric. After completion, I heat set each design with an iron making them durable enough to go through the cold wash cycle, and dryer. Please though, never use fabric softener. 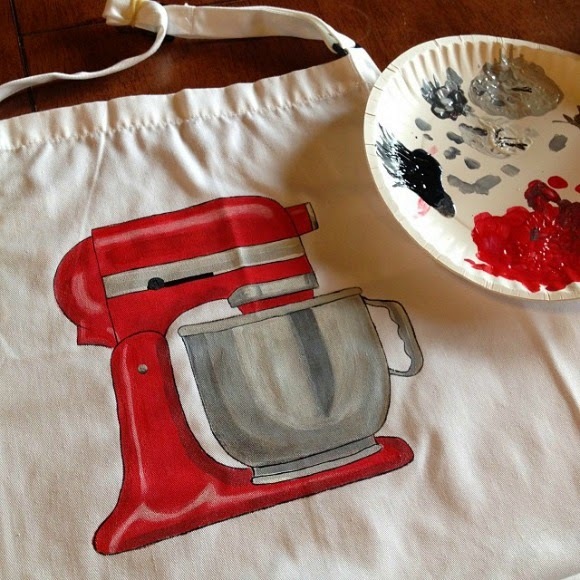 Custom orders through my shop (Kudos Kitchen Paints on Etsy) are always welcome and encouraged, so if you have an apron design in mind please don’t hesitate to contact me. I’ll be happy to design something one-of-a-kind just for you, or someone you love! THIS GIVEAWAY IS OFFICIALLY CLOSED. CONGRATULATIONS TO THE WINNER; KESHA HANSLEY GOODING! !Good Luck to all who enter!!! This giveaway is open to US and Canada residents only! This giveaway will run from midnight on May 10, 2015 to midnight May 17, 2015 at which time a winner will be selected by random rafflecopter drawing. The more options you choose, the better your chance of winning. The winner be notified and will have 48 hours to claim the prize. If the winner does not claim the prize after that 48 hour period, another winner will be chosen. 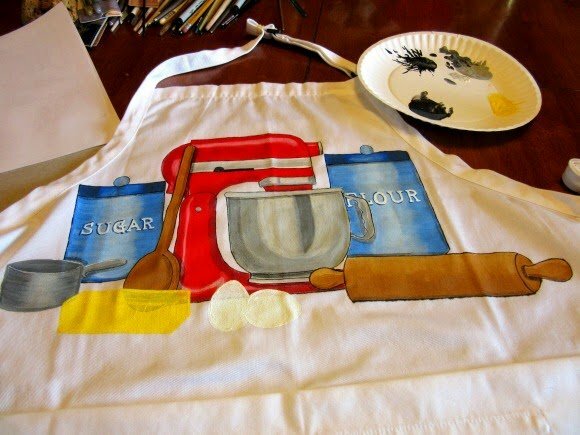 I love to bake so the apron featured in this post would suit me perfectly. It is gorgeous! 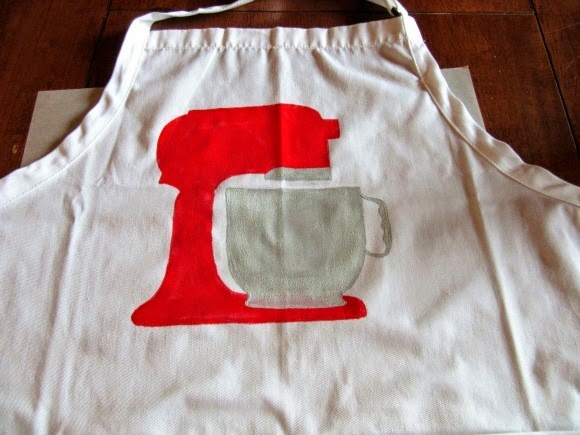 My apron would have a picnic basket, a big bowl of salad with two small bowls, a loaf of bread and a bottle of wine. It's that time of year. 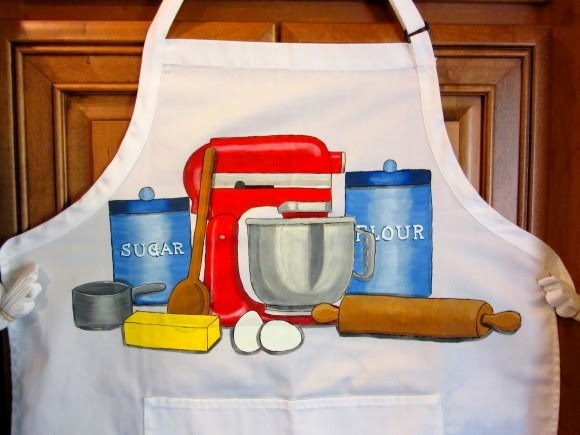 I love the apron you're showing with the processor, sugar and flour. It's so cute. Mine would be " I don't drink, I bake" with a drawing of cake pans and muffin tins. 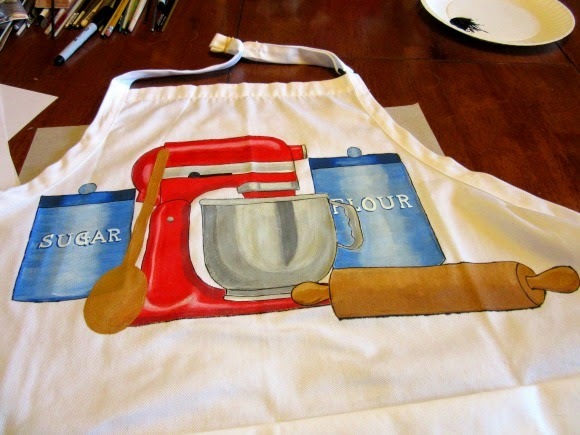 I love love love the baking apron! The Baking Therapy is gorgeous. Thank you for the giveaway. I absolutely love this apron and would be honoured to wear it. 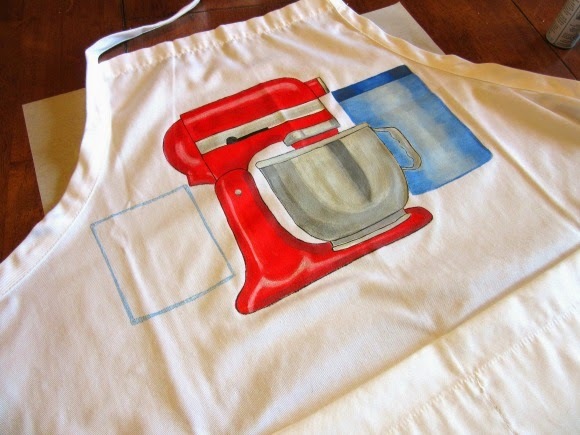 LOVE this apron and it would be my choice of design! My family would love one with cute herbs and spices on it. 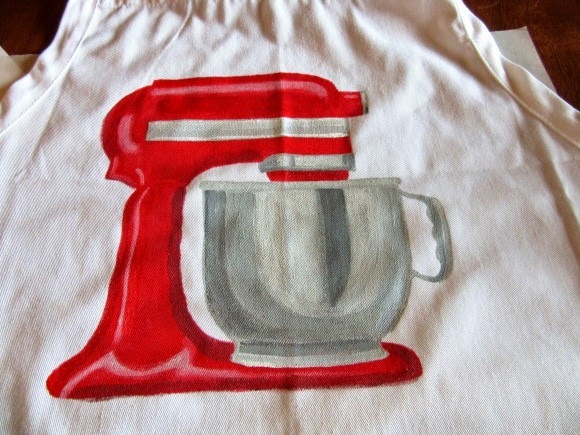 I love this apron; too cute! I LOVE BAKING AND YOUR FEATURED DESIGN IS PERFECT. ANOTHER DESIGN I WOULD LOVE TO HAVE IS PFALTZGRAFF "YORKTOWN" PATTERN. I HAVE BEEN COLLECTING "YORKTOWN" FOR 40 YEARS NOW. 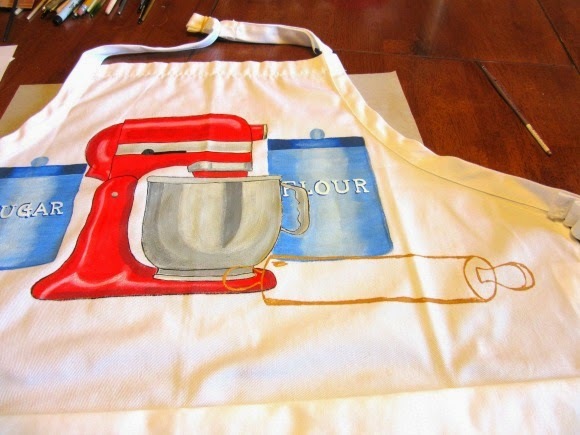 Your aprons are so much fun! I'd love one! Your talent has always impressed me. 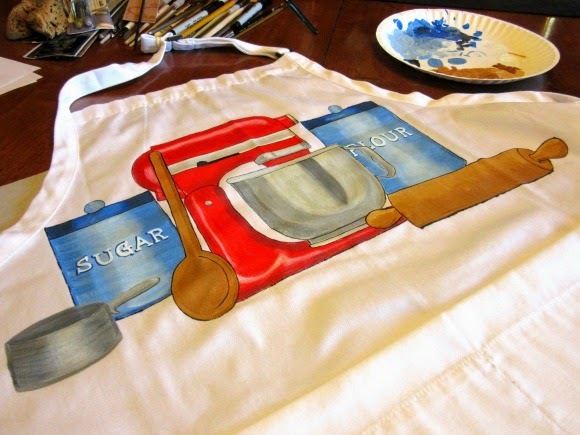 I've so enjoyed seeing all your glass creations on the blog and how wonderful to see your new fabulous apron designs! I am proud of you for getting a shop on Etsy!! Go, Renee! 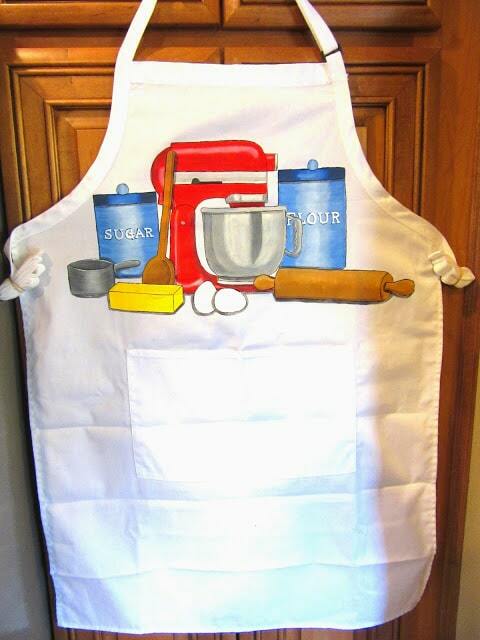 These aprons are fantastic! 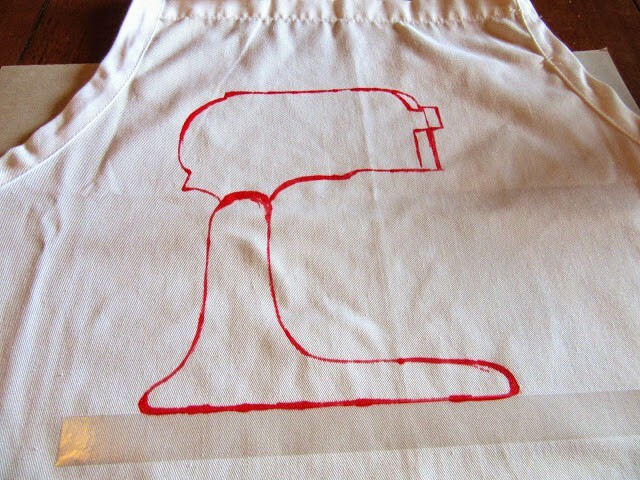 I think the apron you have picture is EXACTLY my style. It even has the same color as my mixer! I can't think of a design that suits me better than the one you have pictured ! I love baking in my kitchen, so this one is perfection! You're so talented 🙂 Love your pretty aprons! I'm the head cook at a school and would love something fun like school lunch super hero or Super lunch lady. something fun that the kids would get a kick out off.